Our planet's ancestral wisdom traditions have stewarded Earth and Star knowledge since time immemorial. They have been waiting for this time of global awakening to convey their holistic lifeways and help contribute to humanity's collective future. Ancient prophecy speaks of "those from the North that will find the Light in the darkness of their times". Andean Paqos recognize people born in our current era as the Ones they have been waiting for. They recognize humanity's increased consciousness, self-responsibility and willingness to operate in loving presence, acceptance, trust, reciprocity and unconditional right relationship as the beginnings of the New Earth. To support this awakening the Andean Holy Mountain Tradition and the Wisdomkeepers Project have come together to offer a cinematic transmission of Light and Sound to assist the evolution of human consciousness. Wisdomkeepers, Paqo Andino is an inspirational film conveying the heart wisdom and celestially integrated lifeways of the Andean Holy Mountain Tradition. Recorded on location in the Peruvian highlands, this intimate documentary takes viewers on a journey into the heart of an ancient eco-spiritual lineage to experience the practical and mystical lifeways that have sustained one of this planet’s few unbroken wisdom traditions. The film's non-narrated format provides an unmediated experience of the Andean maestro’s daily life and their active relationship with the conscious life force inherent within all aspects of the Natural World. Viewers experience a form of wholiness, a way of life based on loving kindness, unconditional reciprocity, equanimity, sustainability and the sanctity of daily activity– foundations of what is known as The Living Peace. The Andean Holy Mountain Tradition offers their knowledge at a time when many find themselves out of balance and searching for deeper means of connection and renewal. Wisdomkeepers, Paqo Andino conveys a heartfelt message to help reawaken aspects of our eternal self and offers non-dualistic insights so people of all ages can better understand their place and responsibility within the greater Whole. Andean Paqos comprise an ancient lineage of wisdomkeepers that embody animistic consciousness. They are recognized as masters of the Living Energy and practitioners of celestially-integrated ways of life. Spanish chroniclers called them by two names, Pampamisayoq (Pampa•me•sigh•yoke), ones who tend to earth-based matters and Altomisayoq (Alto•me•sign•yoke), intermediaries between human, elemental, terrestrial and celestial realms. Andean Paqos cultivate heart wisdom as a way of life. This emotional and spiritual intelligence is complemented by ancestral and experiential knowledge to produce a state of Living Presence that helps maintain balance between Heaven and Earth. Paqos operate at the level of the collective conscious and occupy a way of life that has never been separate from Source. Their tradition is one of the few remaining unbroken wisdom lineages on this planet. They are stewards of ancient holistic lifeways and keepers of sacred cosmological knowledge. In the 1530's, Andean Paqos came under attack from Conquest and Inquisition forces due to their mystical knowledge and inter-dimensional workings within the Inkan civilization. In order to safeguard their animistic lifeways, Paqos and their families fled to remote, high altitude locations where they persevered in seclusion and under extreme conditions for more than four hundred years. In the 1950's, anthropologists discovered Paqos attending to the health needs of indigenous hacienda workers. Subsequent decades brought increased contact, modern conveniences and ideological safety which led Paqos to live and work within larger communities. For the past three decades Andean Paqos have been disseminating their wisdom via ceremonial offerings, educational conferences and experiential retreats. These cosmological exchanges have helped stimulate intercultural awareness and fulfill the tradition's ancestral prophecy which states that humankind will come into balance when the eagle (mental intelligence) and the condor (emotional wisdom) reunite. Currently there are only a small number of Celestial Paqos maintaining the tradition's higher levels due to disruptive influences, mentorship die-off and few apprentices willing to undertake the rigors of this resolute path. 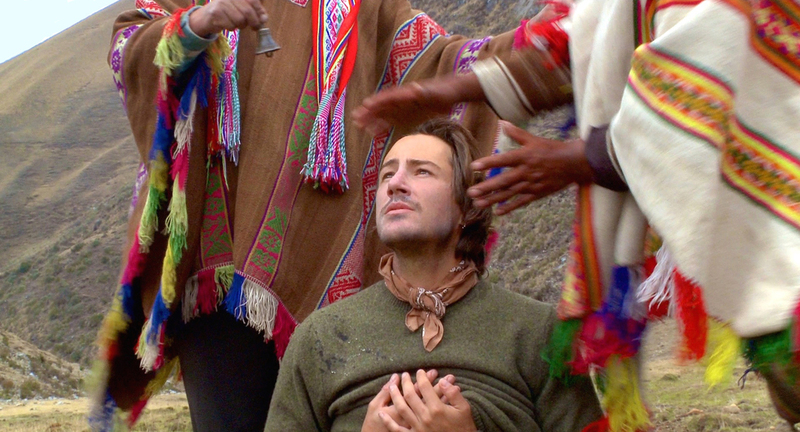 To address this transitional period, Andean Paqos and the Apus, the tradition's mountain spirit benefactors, have begun recognizing and initiating western-born practitioners to help reweave animistic consciousness, restore holistic lifeways and promote spiritual responsibility among industrialized cultures. As with other wisdom lineages, the Andean Holy Mountain Tradition has come forward to help humanity remember its origins, choose truth over power and reconnect to That which has always resided within. "In 2002, I injured myself while filming a television series in the United States. This 'accident' led me into the realms of holistic healing where I discovered the need to fully integrate my physical, mental and emotional bodies as well as develop more cohesive life practices in order to experience deeper states harmony and well-being. My life focus turned to education and certification in a variety of healing modalities. During this period I noticed a natural resonance with the lifeways of the Andean Holy Mountain Tradition. After my initial apprenticeship, I was called and initiated into the celestial realms of the lineage in January 2007. I received the vision for the film in August 2008 while facilitating a pilgrimage in the High Andes. Following the trip, I shared my experience with a close friend who unexpectedly offered to fund the production. I realized then that my worlds were merging and began gathering my 'hats' without knowing that I would have to release all of my ideas and identifications in order to complete what was being asked of me. I would learn, and not always the easy way, that letting go is simply a mental-emotional contraction prior to rebirth. Accessing and recording the secretive lifeways of the Andean Holy Mountain Tradition required cultural sensitivity and invisibility. To meet the film's cosmological and technical needs the Ancient Ones asked me to work solo, combining my experience as a Paqo and producer-director-cameraman to create an offering from within the lineage. Following principle photography I allocated time to wind down teaching and client responsibilities, relocate my family and birth my second child. This period provided necessary space for reflection and integration, and helped me learn to not to get in the way of how the film wanted to present Itself to the world. Editing took fourteen months to complete. It was a somewhat unorthodox approach executed in a single pass from beginning to end relying on the energetics of the prayers and the rhythms of the native Quechua language (which I do not speak). When Spanish and English translations were finished, I set about matching the energetic resonance of the original dialogue and generated subtitles. After several weeks of reflection, I made second edit to shorten the film from 131 to 87 minutes and began final mastering. The project's inspiration and production has been one of trust, receptivity, inter-cultural and inter-dimensional integration into an ancient way of being; a personal and professional paradigm rooted in our natural, unified state of consciousness and "ayni”, unconditional right relationship. This legacy project has Directors beyond myself and I am grateful for their collaboration and unconditional support. I am deeply appreciative of my Andean colleagues, my family and all of the individuals and organizations who have helped realise this film. I also give thanks to the Ancestors whose wisdom and foresight set this all in motion so long ago." Raised in Northern California. Jeffrey's work, studies and spiritual explorations have taken him around the globe, providing firsthand experience within varying systems, ideologies and perceptual realities. In 1995, after ten years of intensive production schedules, location travel and living in metropolitan centers, Jeffrey moved to quieter environs to nurture a path of inner study. He completed Qigong certifications in Oregon and China, sought deeper understanding in Tibet, Nepal and India and received the Avaloketesvara initiation from the Dalai Lama. Jeffrey went on to train and work with Usui-Tibetan-Sai Baba Reiki, Hawaiian lomilomi, meditation, yoga, light and sound therapies, psychosomatic bodywork, quantum healing, wilderness living skills, interdenominational ministry and indigenous philosophy, healing and vision quest protocols. Jeffrey began his education in Andean energy medicine in 2005 with academic programs and research expeditions as well as traditional apprenticeships in the Peruvian highlands. He has operated as a celestial Paqo since January 2007. Jeffrey offers talks, consultations, programs and retreats based on awakening consciousness, holistic living, experiential learning and non-duality. Wisdomkeepers, Paqo Andino was created as a means for people to experience ancient eco-spiritual ways of life, understand animistic consciousness and help foster personal and collective well-being. "I was moved so deeply by viewing the film and attending the programs. I have experienced amazing shifts in perception, abundance, and possibility. I am truly grateful." “Not only was the cinematography amazing, the heart came through. Incredible, Stunning... the purity, the love. I am mostly without words for what I experienced." "I came upon this movie with my wife and have to tell you that I have not been the same since. My life feels like it has renewed purpose."